Miloslav Petrusek, a sociologist from Prague who, after the 1968 Prague Spring, was gradually marginalized as a member of Czechoslovak academia and eventually banned from teaching at Charles University altogether, died last week in Prague. A brilliant scholar and teacher, he had shared the ethos of the New School’s founding fathers, taking seriously the responsibility of the social scientist vis–a-vis society and the world at large, and acting on it. This gifted sociologist and wonderful human being, called affectionately Milan, was a good friend of TCDS. We were lucky to discover him after the Velvet Revolution in early 1990, finally reinstated, and soon to become Dean of the Social Science Faculty at Charles University. Professor Petrusek visited The New School, gave an engaging talk on society and its literature, and – along with Alena Miltowa – became head of the Prague Branch of the Democracy Seminars, an early transregional collaboration that we coordinated from The New School. One of the international meetings of the Democracy Seminars took place near Prague, in Celakovice, in a facility that 5 years earlier had served as a place for training middle-level party cadres. Some of the presentations from those meetings appeared later in Grappling with Democracy: Deliberations on Post-Communist Societies (1990-1995). The book was published by the new publishing house SLON, dedicated to bringing to the country social science literature that had been absent for decades. Please read a remembrance of Milan Petrusek by New School alumna and close collaborator with TCDS, Hana Cervinkova, published in Deliberately Considered. The world of Czech social science is a rather small community concentrated in several academic and research institutions in this country of ten million people. Today’s quality institutions in Prague and Brno are results of the complex process of the post-1989 (re)construction of various disciplines (including sociology, political science, anthropology, philosophy and economics), following their almost total destruction during the Communist rule. While in Poland, for example, a distinct tradition of critical social thought developed despite official restrictions prior to 1989, Czechoslovak social science was subject to all-encompassing censorship that concerned not only indigenous production, but also the prohibition on translations of Western theoretical texts. Leading Czech and Slovak scholars who dared to express critical and independent views were quickly removed from academic and research positions. As a result, the struggle for the (re)construction of the Czech and Slovak social science that began in 1989 was a difficult and somewhat solitary task wrought with many predicaments that characterized academic and scholarly work in this small post-traumatic professional community. Once the borders opened, some (including me) decided to temporarily or permanently emigrate to countries with larger and better established professional milieus. The task of shaping the local tradition was taken up by a few exceptional personalities who dedicated their professional lives to the building of institutions that allowed for the Czech social sciences to grow. The professional wisdom, patience and resoluteness involved in this process is personified by the work Miloslav (Milan) Petrusek and Alena Miltová – an exceptional couple to whom many Czech social scientists owe their careers and some of us much more than that. These sociologists chose to play different, yet complementary roles in the post-1989 reconstruction of Czech sociology and social sciences more generally. In 1990, Milan was already an established sociologist, albeit with twenty-years as a dissident, during which he had been removed from the official position in the academia. Between 1970 and 1989, this leading Czech scholar worked as an assistant librarian in the university library, secretly publishing a samizdat journalSociological Horizons and contributing to other Czech samizdat publications with his own texts and translations. After 1989, he threw himself fully into both a scholarly and administrative academic career. He played the leading role in the building of the School of Social Sciences at Charles University in Prague where he served for two terms as the Dean. Throughout this intensive administrative period (including a term in the position of a University Vice-Provost), Milan published and earned the highest academic degrees. In addition to important sociological monographs, he edited the Comprehensive Encyclopedia of Sociology and wrote textbooks that continue to be used as classics in the country. Milan was also one of the closest advisers to President Václav Havel and later he co-founded Václav Havel’s library. Perhaps of all his different roles and careers, however, the most important to him was teaching. Milan Petrusek was a professor par excellence – a professor who treated teaching with passion and a sense of mission for cultivating future generations of Czech sociologists. In 1991 Alena Miltová, who held a Ph.D. in sociology decided to leave a research career at the Czech Academy of Sciences and established a private publishing house that specialized in the social sciences – publishing both translations and original work. With a hard-to-describe modesty, she has operated this enormous undertaking from a small one-room office, rented from the Academy of Sciences in the center of Prague. In 20 years, she has published over 250 titles, including classic works by such authors as Georg Simmel, Marcel Mauss, Maurice Halbwachs, Thorstein Veblen, Erving Goffman, Clifford Geertz, etc. It is Alena, through her publishing house SLON, who played a key role in the filling of the great gap in Czech language literature after 1989 – the legacy of Communist censorship.Even though they might not put this as their greatest achievements, one needs to see both Alena and Milan as highly successful institution builders in the very complicated milieu of post-socialist Czech social sciences. They both created the necessary institutional infrastructure for generations of Czech scholars to come. While the writing of this piece is motivated by Milan’s sudden death on August 19th, I cannot write about him without thinking about Alena – they were inseparable in life and in my mind. I loved getting postcards from the many different places that they visited on their European sojourns. Neither of them drove a car. They used public transportation to go to distant places, sometimes on the invitation of their friends or former students who owed their international careers to their support. In 2010, they visited me in Wroclaw. We spent a wonderful four days filled with discussions about social sciences, literature and the academia. I remember asking Milan for advise on my upcoming career decisions – he unquestionably supported my return from the high-profile public job to full-time academic career. Their visit was planned to coincide with the New School’s Graduate Faculty’s Democracy and Diversity Institute run by Elzbieta Matynia, who was at the time beginning to work on the book of correspondence between Adam Michnik and Václav Havel. Milan helped her to locate sources. 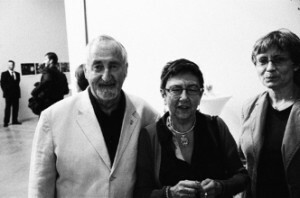 It was a memorable visit, because in the 1990s, Milan and Alena were key members of the Graduate Faculty’s Democracy Seminars, and in Wroclaw they met up with GF faculty that helped create that exceptional transatlantic community of public and academic intellectuals, leaders of dissent in their homelands. I suspect that Alena’s and Milan’s travels always had intellectual subtext – even going for a two-week health visit to a spa involved packing and transporting manuscripts, dissertations and reviews. I remember getting up at six in the morning woken up by our baby son when they were visiting us in Wroclaw, finding Milan hard at work over books from our library, taking neat handwritten notes in his paper notebook with a pencil. I feel it was a gift that I was able to see them last time together just few weeks ago. They were very happy spending their vacation in the picturesque corner of northeast Bohemia near my family house. The place – Babiččino údolí (Grandmother’s Valley) tied to the history of Czech literature belongs to a favorite domestic family destination. Grandmother’s Valley takes its name from a book by the 19th century Czech feminist writer, Božena Němcová, who wrote a Czech children’s classic in which she describes her childhood spent here under the care of her grandmother. Milan, Alena and I had lunch in the restaurant of the small hotel where they were staying not far from a historic museum created in the houses and locations described in the book. As usually, we talked about the social sciences and Milan was keenly interested in developments in the Polish academia. He mentioned his latest book project, but he spent most of the time talking about his students, about teaching and new evaluation standards in the Czech research community. He was concerned with what he perceived was the lowering standard of academic quality, the waning of enthusiasm both among students and professors. But Milan’s eyes brightened as he shared news of his new project – a sociology discussion group composed of his former and present doctoral students. The “Tribe,” as they called themselves, gathered regularly in Milan and Alena’s small Prague apartment and spent evenings discussing sociology. The meetings were structured and began with a three-hour seminar, followed by less structured discussions over wine. It seems poignant that this great professor of Czech sociology, who did not give up his passion for sociology and took to samizdat when he was fired from the academia by the Communists, would decide to renew his currently disenchanted students’ passion for sociology in the private space of his home. It is hard not to notice the resemblance between his home-based meetings with students and the flying seminars that he was a part of in the private spaces of Communist Central Europe. With Milan Petrusek’s sudden death, Czech sociology looses one of its most important architects. However, I feel strongly that I should end this remembrance on a hopeful note: his intellectual legacy will be continued by his students to whom he was devoted until his unexpected death on August 19th. The burial ceremony is taking place today in Prague on August 29, 2012, the 27th anniversary of Milan’s and Alena’s marriage. 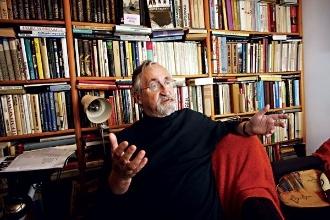 Postscript: On October 5, 2012, Miloslav Petrusek will receive the prestigious VIZE 97 Prize from the Dagmar and Václav Havel Foundation, awarded annually on Václav Havel’s birthday to internationally renowned scholars, scientists and public intellectuals. It is emblematic that neither the donor, nor the laureate, who knew each other well, will be personally present at this year’s ceremony – both Havel and Petrusek were born in October 1936 and neither of them lived to celebrate their 76th birthday.